If you want your Cub Scouts to feel like this poor kid, then keep them sitting at a table the entire meeting doing passive activities. If you are a parent of a boy, you know that we can’t keep them sitting for long before boredom sets in. But, we don’t want our den meetings to become a free-for-all either. It’s important that the boys have both active and passive experiences. One of the things I love about the 2015 Cub Scout program is that there is less emphasis on “school-like” activities and more emphasis on keeping the boys engaged–even during a “passive” activity. Plan your Cub Scout den and pack meetings so that the activities switch between passive and active. When they start to get a bored with a passive activity, you can switch to something that engages them more physically. 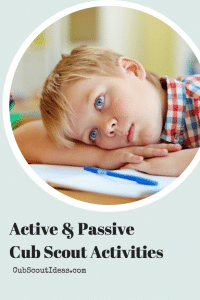 When the boys start to get a little too “excited” with their activity, switch back to a more passive task. Below you’ll find some of the active and passive activities in the 2015 Cub Scout Adventures. Wolf Adventure – Running with the Pack 5: Do at least two of the following: frog leap, inchworm walk, kangaroo hop, or crab walk. Webelos/AOL Adventure – Sportsman 1: Show the signals used by officials in one of these sports: football, basketball, baseball, soccer, or hockey. Here are some examples of engaging passive activities. Tiger Adventure – Team Tiger 4: Make a chart to show three ways that members of your Tiger team are different from each other. Wolf Adventure – Paws on the Path 8: Draw a map of an area near where you live using common map symbols. Show which direction is north on your map. Bear Adventure – Critter Care 3: Make a poster about your pet or a pet you would like to own. Share your poster with your den, pack, or family. Webelos/AOL Adventure – Earth Rocks! 1: Explain the meaning of the word “geology.” Explain why this kind of science is an important part of your world. Share with your family or with your den what you learned about the meaning of geology. What are some of the ways you keep your Cubs engaged during den or pack meetings? P.S. If you liked this Cub Scout suggestion, sign up below for more cool tips!